"Oh my God! That was the best massage I've ever had." 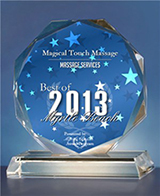 "I Have had massages for over 20 years, without a doubt, this was the very best. Looking forward to the next one." Reiki is an amazing, powerful, yet subtle form of energy healing. Healing energy is channeled thru the practitioner’s body, out his/her hands and into the recipient. Reiki may be given to oneself or others. It is becoming more known and believed that stress it the cause of all forms of illness, discomfort or disease. When we are stressed, vital energy points in the body, also known as chakras, can become sluggish, or even blocked. When our chakras are blocked, energy cannot flow properly thru our bodies. Reiki, clears these blockages, so our bodies can heal themselves, the way they were designed. When receiving Reiki, you may feel sensations of heat, cold, vibration or tingling. Because Reiki heals on a physical, spiritual and emotional level, it is a complete healing system. A Universal healing energy which is greatly beneficial to all life forms: humans, plants, animals and other living forces. A system which works on a physical, spiritual and emotional level. A system of relaxation and stress release. An increasingly recognized form of treatment. The word Reiki is made of two Japanese words - Rei which means "God's Wisdom or the Higher Power" and Ki which is "life force energy". So Reiki is actually "spiritually guided life force energy." A treatment feels like a wonderful glowing radiance that flows through and around you. Reiki treats the whole person including body, emotions, mind and spirit creating many beneficial effects that include relaxation and feelings of peace, security and well being. Many have reported miraculous results. Reiki is a simple, natural and safe method of spiritual healing and self-improvement that everyone can use. It has been effective in helping virtually every known illness and malady and always creates a beneficial effect. It also works in conjunction with all other medical or therapeutic techniques to relieve side effects and promote recovery. The swedish massage is not a reference to Sweden, but refers to a collection of techniques designed to relax muscles, increase circulation without increasing heart load, stretches the ligaments and tendons, stimulates the skin and nervous system and soothes the nerves. Reduces stress both emotional and physical and is often recommended as part of stress management. Shortens recovery time from muscle strains. Swedish Massage not only feels good, it's relaxing and invigorating, while promoting health and well being. We incorporate Japanese Techniques along with Other Massage Techniques for the most Invigorating Massage. A Unique Blend of using Hot Stones, Therapeutic Massage, Acupressure, Reflexology and Collection of Massage Techniques to Relax Muscles, Reduce Stress both Emotional and Physical, Helps loosen Muscle Tissue, Releases Toxins from Muscles, Gets Blood and Oxygen Circulating Properly. It's both Corrective and Therapeutic, while creating a Warm Feeling of Well Being and Relaxation. A Magnification Massage For Overall Healing, Health and Relaxation. Technique that focuses on the deeper layers of muscle tissue. It releases deeply-held patterns of tension in the muscles. Releases chronic muscle tension, helps to breakup and "un stick" the fiber of a muscle. Eliminates scar tissue. Helps loosen muscle tissue, release toxins from muscles, gets blood and oxygen circulating properly. Removes toxins while relaxing and soothing the muscles. It's both corrective and therapeutic. Is a Special Massage and is typically used before, during and after Athletic Events. The purpose is to prepare the athlete for peak performance. To drain away fatigue, to relieve swelling, to reduce muscle tension, to promote flexibility and to prevent injury. It helps alleviate the Stress and tension which builds up in the body's soft tissue during physical activities. In addition to feeling good, it reduces the heart rate and blood pressure, increases blood circulation and lymph flow, reduces muscle tension, improves flexibility and relieves pain. Promotes greater athletic endurance and performance. Lessen chances of injury and reduces recovery time. Is done in a specially designed Chair that has a head, chest, arm and knee rest and is done with the clothes on. It consist of a Blend of Therapeutic massage, Acupressure and reflexology covering the neck, upper, mid and lower back, shoulders, arms and hands and can be adapted to clients needs. The list of benefits are astounding: Increases Energy, Creativity, Mental Clarity, Productivity. Reduces Tension Headaches, Health problems, Anxiety, Neck and Back Pain. Decreases Repetitive Stress Syndrome, Carpal Tunnel Syndrome and Tendonitis are examples. Many Businesses have chosen Massage Therapy as an essential part of their wellness programs. Pregnant women experience a wide range of pains throughout pregnancy, including back pain abdominal pain, leg cramps, headaches, Sciatica and hemorrhoids. Swelling of the extremities and face is common in pregnancy due to the body producing and retaining more fluids. Prenatal massage can improve circulation, which can reduce swelling, improve circulation and relax tense muscles that are causing pain. Consult your doctor before scheduling an appointment for a massage. Massage cannot be given during the first trimester.